A church on this site that was dedicated to SS Simon and Jude (SS Simone e Guida) was documented as a parish church in 1285. In 1296, Bishop Bulgaro Montemelini gave the church to a community of Carmelites, who moved here from their earlier settlement at Santa Maria della Valle. They re-dedicated the church to St Simon Stock, [the Englishman who had been their Minister General in the period 1247-65], and built the adjacent convent in Via Abruzzo to the right. The Carmelites rebuilt the church in 1377 using stone from the demolished fortress at Porta Sant’ Antonio (part of the Fortezza di Porta Sole). Although the church was remodelled in 1571, 1636, 1746 and 1852, much of the original exterior survives, as can be seen from the exposed right wall (on the left in this photograph) in Via Abruzzo. ✴The convent, which extends along Via Abruzzo and behind it along Via XIV Settembre, re-opened in 1861 as l’Asilo della Santa Croce, the first kindergarten in Umbria, on the first anniversary of the liberation of the city from papal forces. It still operates as the Scuola dell’ Infanzia Santa Croce. ✴The church [which now belongs to the Knights of the Holy Sepulcher of Jerusalem] is usually closed. The interior was transformed in 1854-6, when a fresco cycle (ca. 1630) by Anton Maria Fabrizi (below) was mostly destroyed. This damaged and much-repainted banner, which is attributed to Benedetto Bonfigli, was first recorded in 1648 on the altar of the Madonna del Carmine in the church. It was recorded in its present location, on the back wall of the apse, in 1822, along with the information that it was taken in procession every five years on the feast of the Madonna del Carmine (16th July). A date of 1109 on a wooden plaque under the banner was accepted for a period as the date of execution of the banner, but this can be discounted. ✴St Albert of Jerusalem, the Patriarch of Jerusalem who was claimed to have given the Carmelites their rule shortly before his death in 1214. This choice of characters was probably motivated by an attempt to prove that the Carmelite Order was the oldest of the mendicant orders. This fresco in the vault of the nave by Anton Maria Fabrizi was preserved within the later pictorial cycle by Mariano Piervittori (below), as a record of Fabrizi’s work in the church. •five allegories of Virtues (with a sixth by Anton Maria Fabrizi mentioned above). ✴five lunettes depicting scenes from the life of the prophet Elijah in what was the refectory. This damaged triptych, which is attributed to Bartolo di Fredi, was first documented in 1810, when it was transferred from San Simone del Carmine to the Accademia di Belle Arti. It is now in the Galleria Nazionale. The inclusion of the prophet Elijah (see below) suggests that the work was commissioned for the church. (Elijah was regarded as the founder of the Carmelites, and his representation here as a saint wearing the Carmelite habit followed the precedent of the important polyptych (1329) that Pietro Lorenzetti had painted for the Carmelites of Siena). The Perugia triptych is usually dated to the 1360s on stylistic grounds, although it might have been commissioned after the rebuilding of the church in 1377. There is no record of the artist’s presence in Perugia, and it could have been painted in Siena. ✴St Mary Magdalene, Elijah and a kneeling angel on the right. ✴the Virgin Annunciate flanked by angels (on the right). This small altarpiece, which is attributed to Giovanni Boccati, has been dated on stylistic grounds to the 1450s. It was documented in 1822 in the Oratorio della Compagnia del Santissimo Sacramento in the convent. However, this cannot have been its original location since the company was formed only in ca. 1575. The Compagnia del Santissimo Sacramento sold it to the the Accademia di Belle Arti in 1856 and is now in the Galleria Nazionale. The gallery notes suggest that the altarpiece was originally in the friars’ church. Fabio Marcelli (see the page on the artist) has suggested that it might have been the fruit of the link between Giovanni Boccati and the scholar Tommaso Pontano, both of whom moved to Perugia from Camerino in the 1440s. Tommaso Pontano formed an association of lecturers from the Facoltà delle Arti of the University of Perugia in 1441 that originally met in the church of Santa Maria del Mercato. 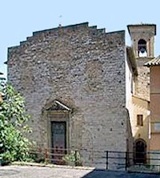 When this church was demolished in 1545, the association moved to San Simone del Carmine and it is possible that the Madonna dell’ Orchestra moved with them. The altarpiece depicts the Madonna and Child enthroned, with an angelic orchestra. The throne is set in a meadow, and two angels kneel at its base to pick flowers. A goldfinch seems to peck the finger of the baby Jesus: the goldfinch is a symbol of the Passion because it feeds among thorns. This panel, which came from the high altar, is attributed to Pompeo d' Anselmo and Domenico Alfani on the basis of an inscription that is not easy to interpret. This inscription also dates the panel to 1520 or 1522. The design of the central figure group is taken from the sketch (ca. 1507) that Raphael sent to Domenico Alfani that is now in the Musée des Beaux Arts, Lille. The panel was removed from its altar in 1813 for dispatch to Rome (probably because it was then attributed to Perugino). However, it was subsequently decided that it should stay in the church, and it was re-installed early in the following year. It entered the Galleria Nazionale in 1863 and now in deposit there.